Saturday, August 3rd in West Hollywood, CA was the Sunset Strip Music Festival. Born in 2008, it takes place on and along the notorious Sunset Boulevard as well as inside it’s world famous venues the Viper Room, the Roxy and the Whiskey where, once upon a time, the Doors were actually the house band. The fest is all about honoring and promoting the live music scene that the Sunset Strip was built on and every year’s festival has a special honoree who has been an influence on The Strip: past honorees have been Ozzy Osbourne, Motley Crue, Slash and last year, the Doors. This year the Strip recognized that girls rock, too: 2013’s honoree was none other than the one and only Joan Jett. Why? Because just like us, the Sunset Strip loves rock & roll. Sabrosa Purr is an LA four-piece that sometimes defies description but often gets compared to notable bands like Smashing Pumpkins and Jane’s Addiction. I simply call them “a collision of stoner fuzz and metal punched up by guitar rock, glam and as ethereal and enigmatic as any drug induced head trip”. They’ve two EPs and one full album and listening to them takes the mind on multiple trips as Will Love’s vocals bend from pliant, boy/man coos to eye-watering, nu-metal howls that would earn Kurt Cobain’s seal of approval…and those will be happening in this song. During SSMF they occupied Viper Room stage. Sabrosa Purr is guitar driven, ethereal, haunting, bombastic, occasionally quiet and with a female rhythm section, it officially makes them one of the sexiest bands, period. The Sunset Strip isn’t the typical stomping grounds for garage rockers Black Rebel Motorcycle Club but Los Angeles is their home, LA loves them and BRMC are always ones to rock for a good cause. The good cause in question was the non-profit Music For Relief (which was founded by headliners Linkin Park). 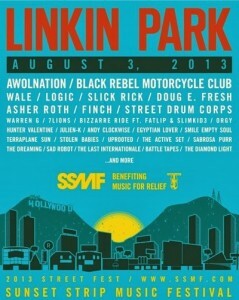 A portion of SSMF ticket sales went to MFR which is all about musicians supporting disaster relief efforts. So on Saturday BRMC did their awesome thing at the festival on the main stage and it was loud and from the heart, which there’s a lot of tucked inside the leather jackets of Peter Hayes, Leah Shapiro and Robert Been. This track is from their latest release, Specter At The Feast, and it’s Black Rebel Motorcycle Club at what I described as possibly their ‘hi-octane grungiest’. It also contains my favorite drum performance from Leah Shapiro since she joined the band in 2008.